Ordered in February and requested to be delivered in mid-June over 300 caladium bulbs were calling my name to be put in the ground. I spent Monday and Tuesday this week planting most of them. This endeavor started but put on hold a couple of weeks ago. There was more to be done than the bulb planting but they were my most important objective. I always seem to forget how fast and furious every thing grows this time of year. Trimming is a constant chore here but now that the nights are warm too it can become a jungle around here pretty rapidly if I don't stay on it! There's been a predicted 60% chance of rain every day for a week (somehow it has missed my plot of ground for the last 6 days but I digress ;->). Yesterday was cloudy and overcast all day and it was actually surprisingly pleasant in the garden shade. Most often the clouds only shield the sun's intense rays but yesterday it seemed a slight bit less humid. I can stand the heat ... it's the humidity that makes gardening this time of year not nearly as ... let's say... refreshing. Blue jays are unusually abundant this year ... I keep meaning to do some research to see if there is a reason for this. I don't mind them as long as they leave the smaller birds alone. They tend to be a little aggressive at the feeders. Activity was happening all around me while I worked. It's interesting how the wildlife doesn't seem to hardly notice me once I've been working in the same spot for a while. The birds especially seem to get comfortable and scurry about their business as if I'm not there. Naturally, it is more often than not when my camera is not near me. Anyone know what this fly bug is? When it flies the double wings on either side of the body flutter in opposite rythmn of the other one. It was kind of feminine looking if you know what I mean. The four wings are clear like those of a dragon fly but are folded against its body when resting rather than stationery out to its side. A damsel fly wings don't lay next to its body like this ... I don't think. This little critter held still on the stalk of a society garlic stem while I snapped away. Purposely I've set up bird feeders filled with safflower seed only. The cardinals, chickadees, titmice, wrens, parulas & other small birds especially like this fare. The squirrels are not supposed to like it. This method has worked for Hoe & Shovel for several years ... until this year. For some reason there are some squirrel s around here that didn't get the memo. It amazes me how far they can fly, how long they can stretch and how much their lazy-selves can eat. 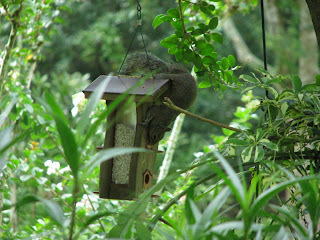 If they don't eat the seed they scatter it quickly to the ground with the weight and scratching around of their bodies. 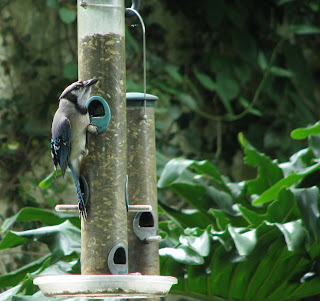 It has forced me to keep smaller amounts in the feeders and refill them more often. Otherwise it is wasted in a hurry by all that lands on the ground. Squirrels are a nuisance in general and we have loads of them around her. 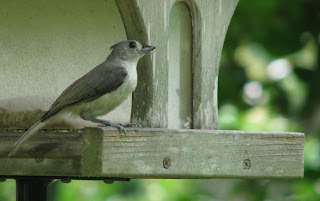 The camera was pointed on the squirrel when this juvenile titmice flew in to land on another feeder right next to me. The juveniles didn't hear their parents when they warned them not to get this close to humans. While giving all the new caladium bulbs a good drink of water suddenly there were all kinds of little birdies literally trying to fly into the spray. I've noticed there's an interesting thing that happens when watering in the middle of the day. Often times the birds will start flying all around the water in an effort to get to the water. I am always amazed at how close they get and how many of them will flutter all around me and the water without fear. All of a sudden there were titmice and northern parula pairs flitting from tree limbs and dipping in the air to get to the fresh water. In pairs they swooped down to almost reach the spray of the water but not quite reaching it would land on a nearby branch, fly back up to an oak limb higher in the air and back to try again. After this went on for a few minutes I dropped the hose, went to get my camera in hopes they would come back when I returned. Strapping the camera around my neck with one hand on the snapper and the other hand commencing to water I waited to see if they were still game for a quick sprinkler spray-bath. 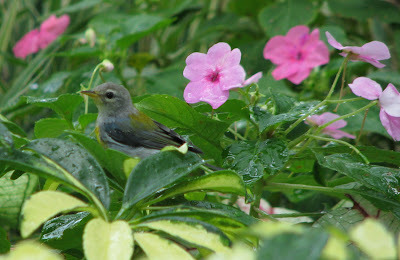 I have been trying for weeks to get close enough to the 4 inch cutie Northern Parula that have taken up residence here. It wasn't long and a few of them came back to flit back and forth from the towering oak tree trunks and branches to perch in the low branches of the xanadu. 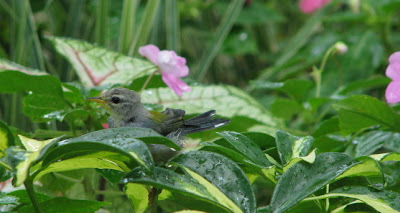 They ducked their little heads around under the wet leaves of the variegated schefflera to refresh their feathers in a midday sprinkler shower. After all that activity in the back garden I walked around to the front garden to put my tools away and call it a day. My eye caught sight of a pileated woodpecker in flight from my trees to across the street to the neighbor's. A fairly common sighting, but nevertheless I paused to watch its landing as I never tire of the wonders of the outdoors. 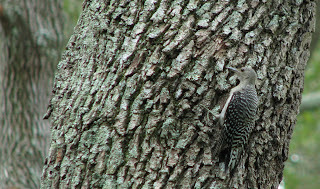 Almost simultaneously I looked straight ahead from where I was standing and a red bellied (above) woodpecker was intently foraging a small, empty cavity on the bark of an oak. Then as I snapped away on my camera another motion caught my attention on the oak limb 8 feet above my head. 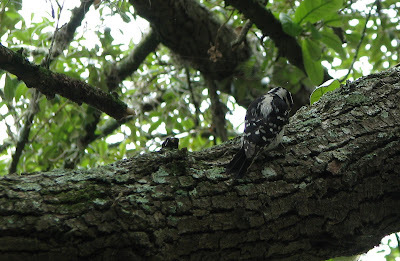 A downy woodpecker (that didn't cooperate for a great photo) was also foraging the cracks and crevices of the oaks. There is so much to enjoy when outdoors. There really is nothing like spending time and breathing in the joys of all of God's creation. This post and pictures are so enjoyable. I don't think I've ever seen your gardens not looking their best. Can't wait to see all the Caladiums! I have a problem with squirrels too so I feel for you--it's expensive. What a delightful day, except for the pesky squirrels, but even then they led you to some lovely bird experiences. Sometimes I hook the hose and mister nozzle to the back of a garden chair(holds it upright) to mist a section of the garden....just to let the birds have a fly through. They love it. I think yours was way more personal an experience. Hi Meems! I followed your here from Robin's Nest. I am also a wife, mom, mimi and native Floridian. I grew up in Winter Haven but now live on about 5 acres between Ft. Myers and Lake Okeechobee. My blog is a mixed bag, but if you have time to come visit, you will see that I enjoy photography and our beautiful flora and fauna, too. Blessings! Seeing those birds come in to your water sprinkling makes me realize how dry it must be there. When birds come that close for water they are almost desperate. It is a good thing that you take such good care of them. They reward you by coming near. You have quite an assortment of birds coming to your garden. I can see why it is beautiful. 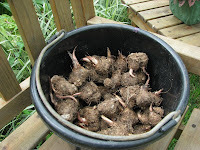 I love caladiums butI can't get them to grow from bulbs. I just buy them already started in pots. You have a wonderful wildlife garden. Lots of things you write about your garden are very familiar in my garden even so my garden is in the southern hemisphere, the wildlife looks completely different. Caladiums are very exotic, colourful plants. 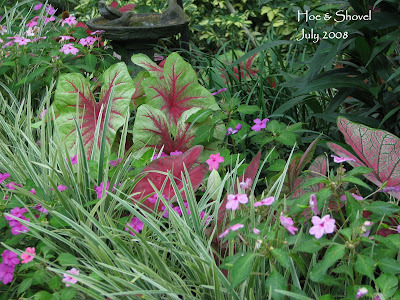 They have never really done well in my garden or I have not taken enough care. Do they die off too in winter in your garden? 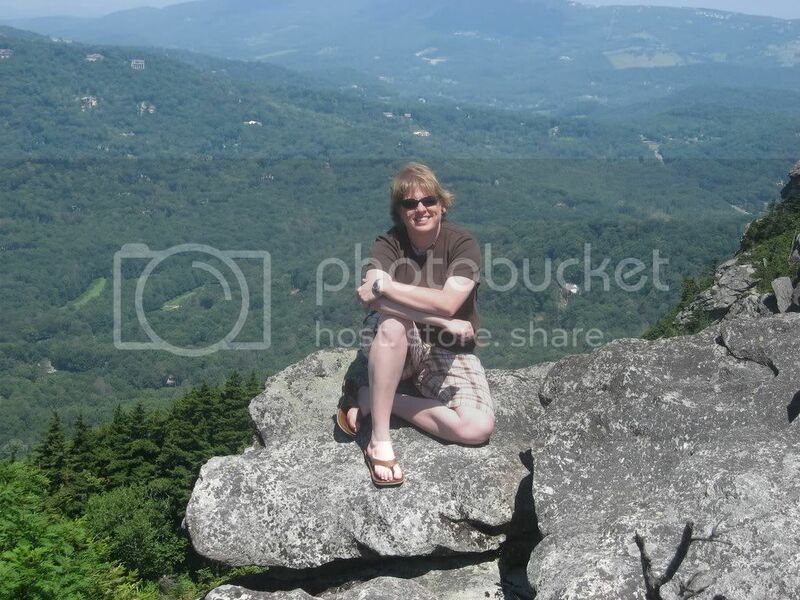 Great shots Meems. Wow! That's a lotta caladiums! How cool the way the birds flock around you for a refreshing sprinkle when you're watering. I'm sure your feathered friends are grateful for the cooling shower. p.s. There's an award waiting for you at my place this morning. You sure have been working hard lately...well you always do. At least there has been a little respite with the shade this week. As always love the photos! Great pictures and we have an over abundance of squirrels this year! They are running, hanging and jumping around. I need a new batch of cats! Wow, those are great bird shots, and I really enjoyed your post about their activity. Felt like I was right there in the garden as well:).Cheers! Thank you everyone for coming along with me to see the busy summer activities that are always going on as I work away in the garden. 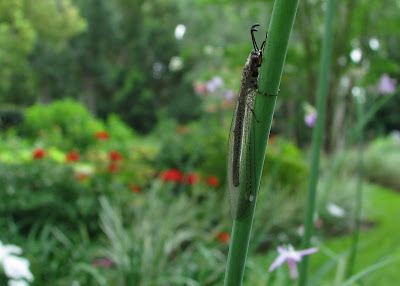 Being up close to view the habits of the critters we've attracted is so much a part of the joy of gardening. 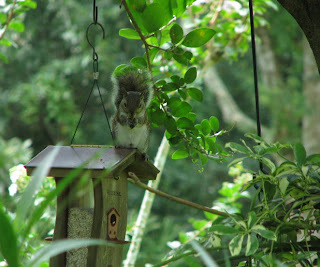 Have been diligently gardening all morning today and again I am enjoying the wildlife. 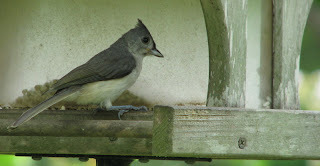 Got some very nice photos of the titmice (juveniles) in the birdbath. So many butterflies are out and about in the sunshine today and the sweet songs of the birdies are keeping me company in this heat. I'll be wrapping it up shortly after lunch... well... that's what I always say anyway. totally love those northern parulas. too cute. serious/silly/me: Not only are they cute as buttons but they are quite active in their garden visiting. And did I mention how totally charming is their sweet voice while taking up residence in the oaks? I love the birds. Have you had your yard certified as a National Wildlife Federation Wildlife Habitat? It looks like you've got all the needed elements.